The death of Barbara Cook has been announced by her publicist. Once the supreme soprano of the Broadway stage, she evolved over time into an authority on the American art-song. She gave recitals at Carnegie Hall and mentored innumerable singers in the DMZ between opera, musicals and pop. In performance with James Levine and the ASO. Miss Cook was a regular in London, alongside her musical partner, Wally Harper from the late 80s. She would always get rave reviews for her shows, but she had a habit of taking London engagements in places like the Barbican, Drury Lane and the Theatre Royal Haymarket. These theatres were much too big for her to sell out and often there were lots of empty seats. It was always slightly disappointing to be watching a wonderful show in a row of empty seats. For me, she was at her best at the Donmar. She started her London career there and then returned years later to the new theatre to do a week of shows. She was class personified. It was really one of the great nights in the theatre, I’ve ever had. 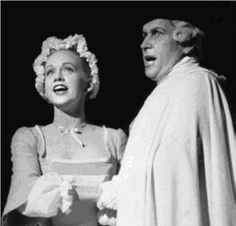 My real passion is opera, but there was something so special about Barbara Cook, that I have loved for so many years. Her album Close as Pages in a Book remains one of the great musical theatre song recitals I’ve ever heard. P.S. there’s no overstating Barbara Cook’s iconic status, but the American Songbook has not died, any more than it died with Ella Fitzgerald. Terrific voice, great diction; a long life well lived. I listened to your link but the more of Sondheim I hear the less and less I like it! There’s something cloying about his love-songs and I don’t think the music was his strong point. Chacun a son gout. I find it helps the poignancy of this song to know that “Buddy” has been cheating on her for years, with whatever available piece of tail happens to walk by. Most of his love songs have a dark(er) subtext that is easy to ignore, or not know about. I had the privilege of hearing Barbara Cook and Wally Harper twice – once in Toronto and once in New York. Quite apart from her wonderful vocal timbre, she had the ability to colour her voice with subtle nuances of the lyrics. One was also struck by her sincerity and honesty of performance. Two of my favourite renditions of hers are “Stars” by Janis Ian and “My Father” by Judy Collins. Tonight there is another star in heaven. Rest in peace, dear Barbara.